Ever wanted to chat with a friend from another country who does not understand your language or you do not understand his/her native language? 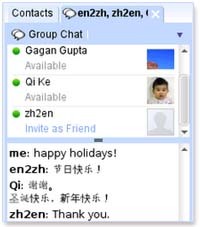 From now on… this can not be an excuse or PROBLEM for NOT chatting with friends with different language orientation on Google Talk. Google has launched translation bots to facilitate ‘Real-time’ language translation while chatting on Gtalk. For starters… “A bot is a piece of software that acts as a chat contact and provides some fun or useful functionality”. Procedure of using these bots is real easy.